Magnet mix, polymer clay, assorted colors, 40x32mm mama and baby turtle. Sold per pkg of 4. Item Number: H20-1551JU Have a question about this item? 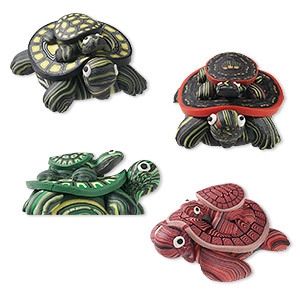 Handcrafted polymer clay standard-strength mama turtle magnets with baby on her shell are perfect for filing cabinets, cash registers and refrigerators. Great for resale--so cute they're fun just to set out as window sill or potted plant decorations and as office desk buddies. Colors can include green, red, pink, yellow and black. In each lot of handcrafted items, colors, shapes and sizes may vary. Standard magnetic strength. 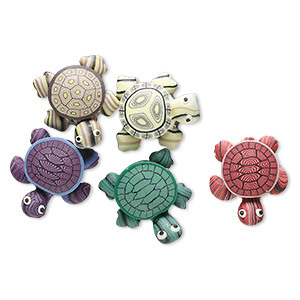 Magnet mix, polymer clay, assorted colors, 24x22mm turtle. Sold per pkg of 5. 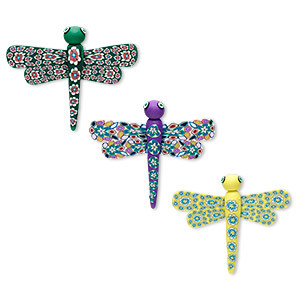 Magnet mix, polymer clay, multicolored, 54x52mm-58x56mm dragonfly. Sold per pkg of 3.